a good take on rice and beans. Sometimes I don’t have the time or energy to fix dinner. I’m sure I’m the only one, right? Truthfully, that sometimes is like 3-4 nights a week, but if we ate out every one of those times we’d be struggling with our weight more than we do and hurting in our bank account. 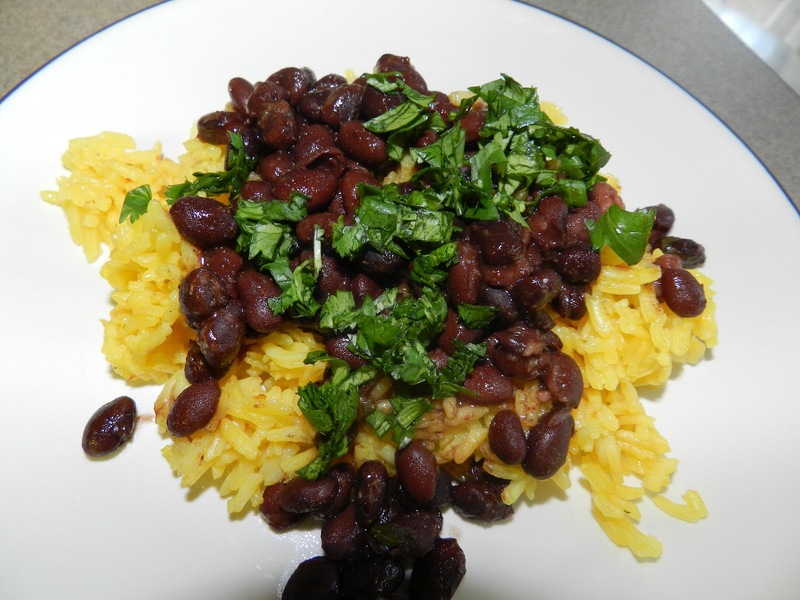 My Granny gave me this rice and beans recipe that is so simple, fast, and delicious [thanks Granny]! I love it and so does Jack! Turns out that boy loves his black beans. The recipe calls for saffron, which is definitely tasty but so high in salt. I made it with saffron the first time and loved it, but since then I’ve been trying to use brown rice or at least plain white rice. It still tastes delicious. Garnishes: sour cream, sliced green onions, fresh cilantro. 1. Cook rice according to package directions. Keep warm. 2. Drain beans, reserving 2 T liquid [what I refer to as the bean juice. 3. Combine bean juice, lime juice, chili powder, and cumin in a saucepan & cook over medium heat until thoroughly heated. 4. Stir in 1 T cilantro. Serve beans over rice. Sprinkle with remaining cilantro. Garnish if you want. I don’t except for more cilantro [the more the better]. If you do garnish with sour cream– go easy on it and go low fat.